Customize DVD template for video to DVD conversion. Have a number of videos on your Windows system that you want to play on your DVD player? Using DVD Maker is the most straightforward solution to this. Using DVD Maker Windows 10, you can burn your videos as well as photos to a DVD disc without any need for any additional software. Read below to know more about Windows DVD Maker Windows 7 and its alternatives. Windows DVD Maker is free software that comes pre-installed with Windows 7 and Windows Vista (Home, Professional, Ultimate, and other versions) systems. You can check the program on your PC by going to the Start Menu and looking for it in All Programs list. This DVD maker Windows 7 supports popular video, audio, and sound file formats as listed below.
. Supported Video formats: ASF, AVI, DVR-MS, M1V, MP2, MP2V, MPE, MPEG, MPG, MPV2, WM, WMV.
. Supported picture formats: BMP, DIB, EMF, GIF, JFIF, JPE, JPEG, JPG, PNG, TIF, TIFF, WMF.
. Supported Audio formats: AIF, AIFC, AIFF, ASF, AU, MP2, MP3, MPA, SND, WAV, WMA. Depending on the support of your DVD writer, DVD Maker Windows 7 allows writing on a number of discs including DVD+R, DVD+RW, DVD-R, DVD-RW, and DVD-ROM. 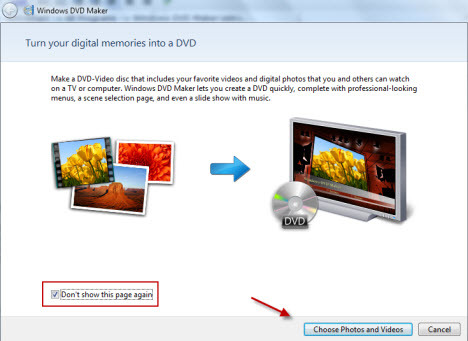 Step 1: Open Microsoft Windows DVD maker on your system and click “Choose Photos and Videos” to start the process. Also, insert a blank disc into your system. Step 2: Click +Add items to browse local videos on your PC. Select videos and hit Add button. Multiple files can be added here. Alternatively, you can also drag and drop the files. Step 3: To select DVD parameters, playback settings and make other changes, click “Options” at the lower-right corner to open DVD Options window. Once all changes are done, click Next to move ahead. Step 4: Next is the step for customizing DVD menu. The right pane of the program screen shows the available Menu Styles. Choose the most suitable one. The Preview button at the top can be used to check the created disc. You can customize menu, add Menu text and perform other functions. Step 5: Finally, hit the Burn button at the bottom right corner to start converting your videos or photos into a DVD disc. Windows DVD Maker is a decent option for creating discs but only on Windows 7 version of the OS. The software does not work on Windows 10/8 and other OS versions and thus a Windows DVD Maker Windows 7 alternative is needed. 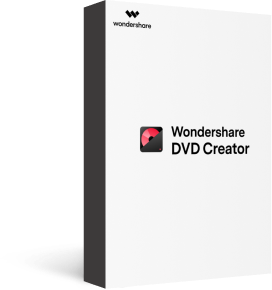 Wondershare DVD Creator is excellent software to use and an apt alternative to Microsoft DVD maker. In addition to almost all OS versions support, the Windows DVD Maker Windows 10 alternative proves to be better in many other aspects. The software supports almost all major and popular video, picture and other formats for DVD burning. You can burn your files to DVD as well as Blu-ray discs in excellent quality output files. There are over 100 menu templates to choose from. The built-in editor of the software enhances overall disc experience by trimming and cropping unwanted parts, adding images and watermarks, adding transition effects, rotating photos, and also adding background music. You can also adjust volume, set aspect ratio, and finally preview the created disc. · Burn videos in any format to DVD/ISO/DVD Folder/Blu-ray Disc/Data Disc. 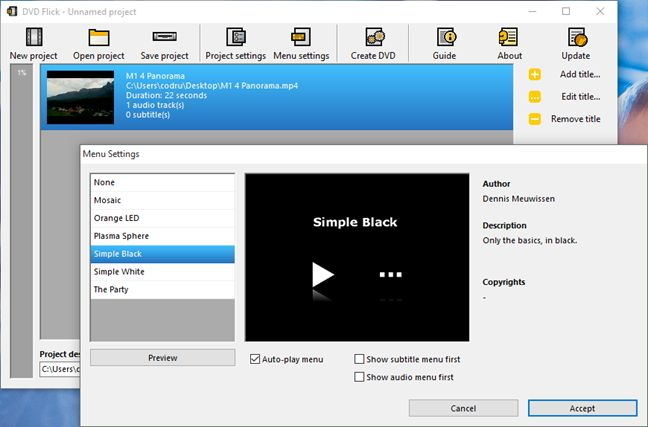 · Best alternative to Windows DVD Maker for Windows 10/8/7 and burn videos/images to DVD simply and quickly. 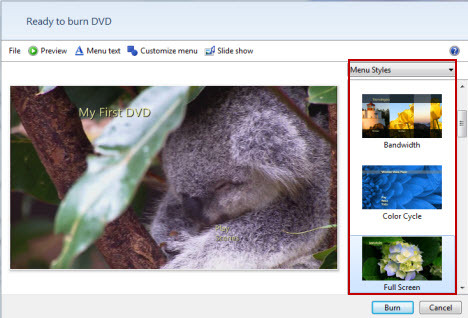 · Customize DVD menu with 100+ free templates and frames, even set title, background picture and music, etc. 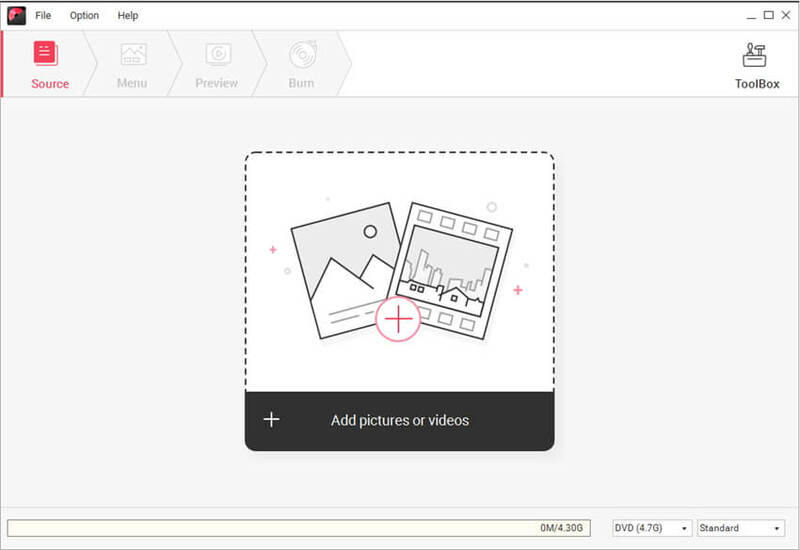 · Build-in editor to personalize videos by Trim, Crop, Add watermarks, etc. · Windows video DVD maker with fast burning speed and high-quality output. · Additional functions including Burning Data Disc, ISO to DVD, DVD Copy, Video Editor, Slideshow Maker, etc. · Supported OS: Windows 10, Windows 8/7/XP/Vista, Mac OS 10.14 (Mojave), 10.13 (High Sierra), 10.12, 10.11, 10.10, 10.9, 10.8, 10.7, 10.6. 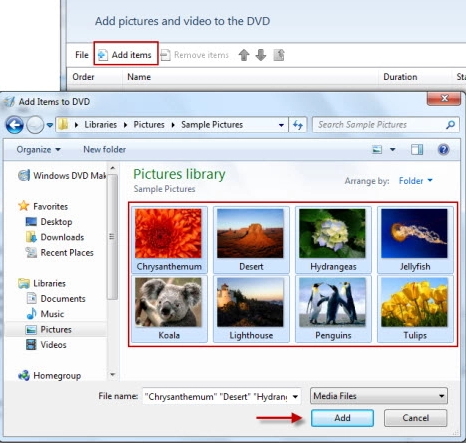 Step 1 Open Wondershare DVD Maker Windows 10 and choose to Create DVD Video Disc. Open Wondershare DVD Creator on your Windows 10. Select the option Create a Video DVD Disc. Step 2 Add media files to Windows DVD Maker Windows 10. From the Source tab on your interface, click " + " to search and add videos or pictures present on your PC. You can also simply drag and drop videos to the program. The added videos will appear as thumbnails on the left pane of the screen. To edit these videos, click the pencil-like icon on the thumbnail and the Video Edit window will open. Make the needed changes and click OK to confirm. Step 3 Choose DVD menu template. Click the Menu tab from the main interface and you can see the Menu Structure clearly. Double click to apply a template from the list on the right side of the pane. If needed, you can also download more template designs by clicking download icon. The options to select aspect ratio, add background music, and perform other template customizations by hitting related icons. Step 4 Preview DVD and Create DVD. To check the created DVD, click the Preview tab. If you are not satisfied with the design or want to make other changes, you can go back to the Source or Menu tab before burning your files. Select the Burn tab and a setting window will open. Choose Burn to Disc option and set other parameters after inserting a blank disc into your PC. Finally, click Burn to start burning your media files to DVD disc. There are a number of reasons why Wondershare DVD Creator proves to be better when compared with Windows DVD Maker. 1. Windows DVD Maker can be only used on Windows 7 version of the OS. On the other hand, Wondershare DVD Creator not only supports Windows 10/ 8/7/Vista/XP/2003 versions of the OS but also Mac system. 2. 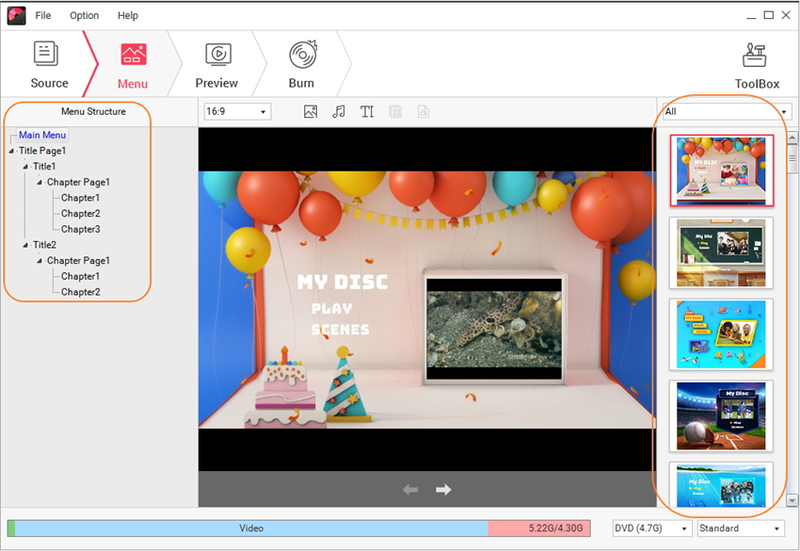 Wondershare DVD Creator supports almost all video and picture formats including SD as well as HD so that you do not face any file compatibility issues. 3. In addition to DVD disc, Wondershare DVD burner software also allows burning your files to Blu-ray discs which is not a case with Windows DVD Maker. 4. Wondershare DVD burning software has more than 100 static and dynamic DVD menu templates to choose from. Additional designs can also be done. 5. The built-in editor allows personalizing your videos with a number of features like cropping, trimming, adding watermark, adding background music, and others. Most Windows 10 users may have already known that it comes with a useful program called Windows DVD Maker. It's a really kind of practical burning tool for making DVD. If you just want to get your home videos burned to DVD without editing, it will certainly be your first choice. However, what if you'd like to edit video and burn DVD like a professional? Well, I suppose this article will work this question out. We are going to make a full comparison among Windows DVD Maker and professional DVD burning tools - Wondershare DVD Creator and Wondershare Video Converter Ultimate out there. Supported video formats 150+ formats, all the popular video formats. 1000+ formats, almost all the video formats. It supports video input of which only comes from Microsoft itself, formats like WMV, ASF, MPG, etc. DVD Menus Yes, 100+ DVD templates available. Yes, 20+ stylish DVD menus with different topics. Yes, 20+ animated menu templates and 10+ frame templates. Photo Slideshow option Yes, allows creating photo slideshow with photo editing features. No Yes, create photos with basic features. In addition to paid professional software, there are a number of free DVD maker Windows 10 available as well. For occasional DVD burning needs with basic features, these freeware prove to be a good choice. Listed below are some popularly used programs for Windows10/8. This is one of the most popularly used DVD maker freeware that is compatible with Windows 10/8/7 versions of the OS. The program facilitates creating good quality DVD disc from VOB format, but you can convert a range of video formats including MP4, AVI, MKV, MPEG, FLV, MOD, and many others to VOB firstly. The software also has a YouTube downloader for the free download of movies from the site. 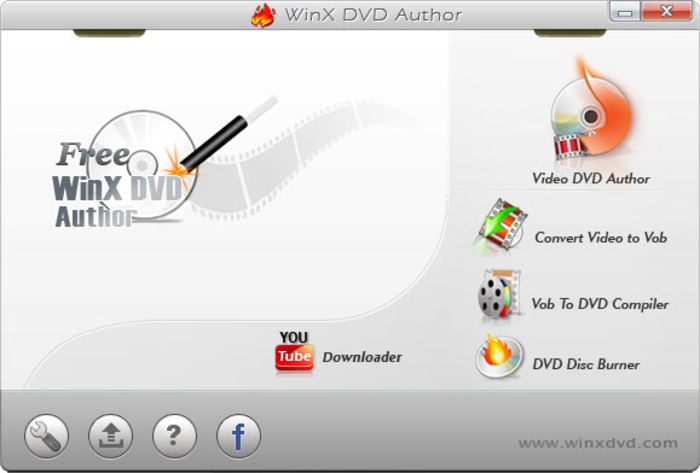 WinX free DVD maker no watermark comes with a host of additional functions like setting aspect ratio, supporting different languages, and others. Without any spyware, adware, or plug-ins, the software is simple and reliable to use.
. Supports converting a wide range of video formats to VOB for DVD burning.
. Created DVD does not have any watermark. No option to burn videos to ISO files. 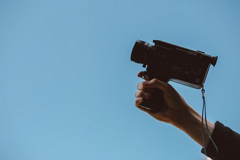 Limited video and DVD editing features as compared to a professional software. Can't support burn any video to DVD instead of VOB to DVD. The interface is not easy to use. This is another video DVD maker free program that is widely-used. The software is capable of burning almost all types of videos to a DVD disc. It is lightweight software with a simple to use interface. So even if you are not a very tech-savvy person, you can burn DVDs in just a few clicks using Sothink. In addition to creating discs, the software also facilitates to save videos in ISO files or DVD folders for later disc burning. There is one menu template in the free version of the program which you can customize with an array of features. Additional settings supported include playback mode, playback order, font color, and size, aspect ratio, and others.
. Support converting videos to DVD disc, ISO files, and DVD folders.
. Supports all major video formats.
. Fast DVD burning speed.
. Only one menu template available.
. Does not support a lot of configuration options. DVD Flick is a known Windows DVD maker free tool that is compatible working with Windows OS. Simple in use, this software offers all basic features needed while burning a DVD. 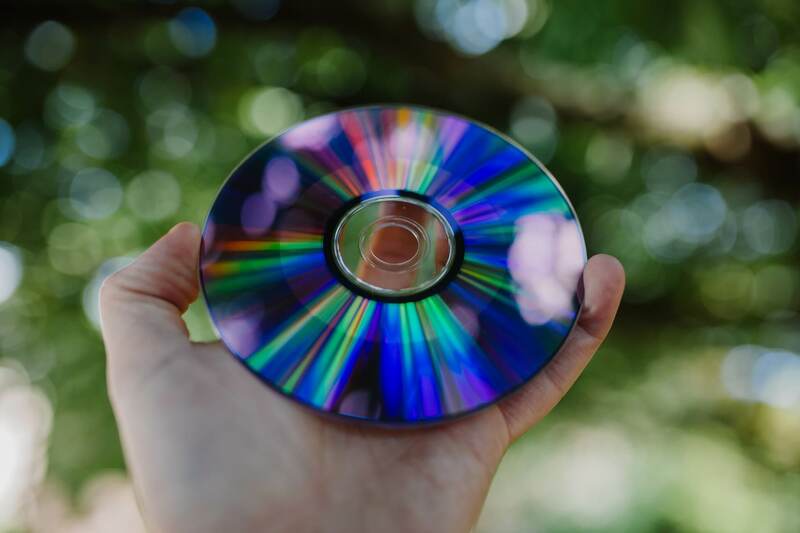 A number of video and audio formats are supported by the program for disc burning. There is also an option to embed subtitles on the videos while burning them to DVD. There are six default menu templates available to choose from. With a user-friendly interface, the software is a good choice for the users with limited tech knowledge.
. Supports a wide range of video formats.
. Does not support image files, and thus picture slideshows cannot be created.
. Only 6 menu templates to choose from. 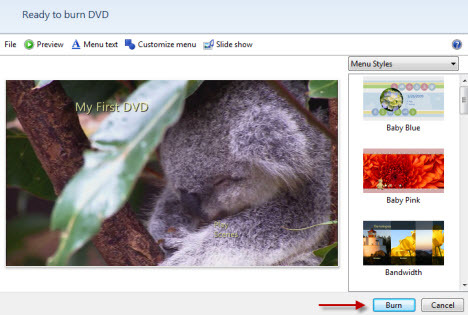 No option to create or design your own DVD menu.
. No option to add a background image or video. There are a number of DVD makers available and selecting the right one is very important to get the desired disc. Considering the features and quality, it can be concluded that Wondershare DVD Creator is definitely the best DVD maker for Windows 10 as well as other OS. The software lets you convert all types of video and image files to desired disc type in best quality. So install Wondershare Windows DVD maker Windows 10 and get all your precious videos on a disc in no time.